April abounds with poetry events and it is hard to choose which ones to go to. Yesterday I went to the 12th annual Plunkett Poetry Festival at UMaine-Augusta, always a fun opportunity to hear a lot of Maine poets. Spring has finally come to southern Maine and we are all delirious. Lowe’s opened its garden section and people wearing shorts and Tshirts were madly buying pansies, MiracleGro and all kinds of things they can’t really use or plant until Memorial Day. 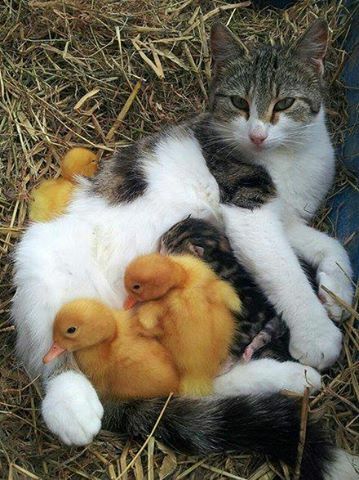 This is Easter week coming up and here’s a photo of a cat with some chicks. I saw my friend Bruce’s new chicks yesterday, including some bantams – beautiful birds. His yard is full of intensely yellow and purple crocuses. Renewal, rebirth, warmth, blossom. Here is a poem I love about saying YES to the world. What can it mean ? Posted in Uncategorized and tagged chicks, garden, Maine poets, Muriel Rukeyser, Plunkett Poetry Festival, poetry, renewal, spring. Bookmark the permalink. 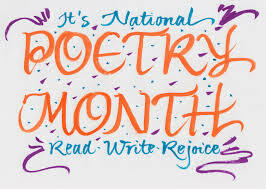 April is National Poetry Month, and for poets, it is an unusually busy time with many readings and events on the schedule. Sometimes we feel that the other eleven months of the year, poetry is “chopped liver”, but then, let’s be real – for many people, poetry is never on their radar. I always hope that during April, people who are hostile or indifferent to poetry will attend a poetry reading or pick up a book of poems and be converted. I’ve seen it happen with reactions to the ferocious energy of slam poets, at open readings, to poetry on the radio, in buses, in classrooms, and on the page. Discard your ideas about poems based on whatever poetry was forced on you in school. Poetry doesn’t have to be puzzling, rhyming, abstract, ancient or dull. There is poetry out there to move anyone – funny, touching, revolutionary, classic, hiphop, ballads, sonnets, haiku, free verse – so many kinds of wonderful poems. 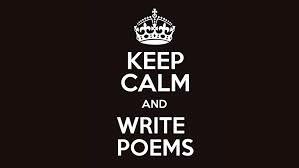 Posted in Uncategorized and tagged haiku, National Poetry Month, poems, poetry, poets, slam, sonnet. Bookmark the permalink.